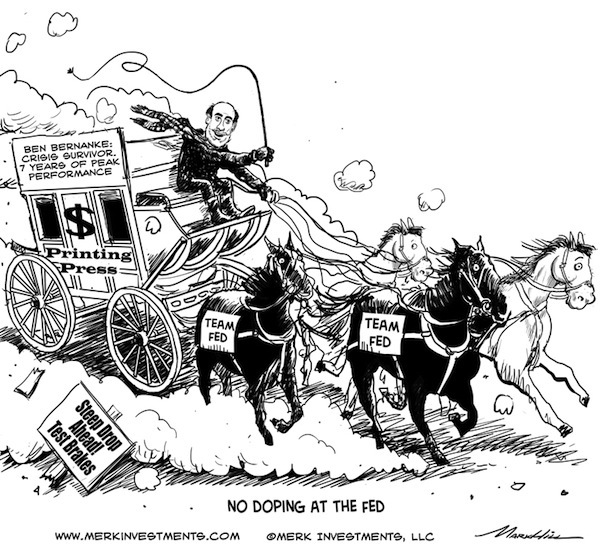 Merk Insights - Is the Fed Doping the Greenback? Is the Fed Doping the Greenback? For seven years Ben Bernanke has played Master of the Universe, that is, has been Chairman of the Federal Reserve (Fed). Bernanke vehemently denies his actions put the US economy at risk. Au contraire, having prevented the US economy's collapse, the Fed's actions have yielded profits to taxpayers. Naysayers lament money doesn't grow on trees, value can't be created through the printing press. Bernanke calls out his critics, and points to low "core" inflation as proof his policies are working. No, he is not doping the economy, the greenback, his methods are legit. Or are they? To get to the bottom of this, we don't wait for Bernanke to chat with Oprah, we look at what may be hiding in plain sight. We know the Federal Open Market Committee (FOMC) is meeting this week. We believe we know what their goal is: to convince the market not to sell off bonds, no matter what. Quantitative Easing (QE), Operation Twist, employment or nominal GDP targeting, those are not ends, just the means, the tools of the day. You see, Bernanke firmly believes one of the biggest mistakes during the Great Depression was that interest rates were raised too early. Faced with a major credit bust, deflationary forces might get the upper hand should policy makers take the foot off the gas pedal. Trouble is that the market can do the tightening without the Fed, causing upward pressure on especially longer-term rates when bonds are sold off. To mitigate the risk of a selloff in the bond market, the Fed is committed to keeping rates low, through buying bonds, engaging in Operation Twist, etc. Last spring, a couple of good economic indicators caused a significant selloff in the bond market. It was a false alarm, as the economic growth did not kick into high gear. But it made it clear that the biggest threat we are facing might be economic growth itself. Why? Because in a zero-rate environment, debt may matter little, but as rates rise, the leverage of debt weighs against one. Notably, it weighs against government itself, as financing deficits might become prohibitively expensive. The Greeks know what we are talking about; the Japanese might soon find out; but with trillion dollar deficits, the US, similarly, can ill afford to go back to paying interest rates on government debt that were the norm less than a decade ago. We allege the Fed is engaging in doping; the cheap money is like a fix for a drug addict. So far, however, the Fed's own anti-doping commission, a research staff with the best credentials and intentions, has not found any foul play, as economic indicators show a gradual recovery with little inflation. But we believe the Fed has to thank the anemic recovery for covering up the greatest money printing scheme in US history. Except that the Fed has not really been covering much up, documenting in plain sight how much money it has been printing. And, of course, the Fed has not really printed money, but done the virtual equivalent, creating money out of thin air, with the stroke of a keyboard, buying Treasuries and Mortgage-Backed Securities (MBS). Conveniently, the more money the Fed prints, the more fixed income securities it buys, the greater the interest it earns, the higher the annual profit it transfers to Treasury. The scheme looks so irresistible, but hides some dark truths. Amongst them, those "profits" might evaporate when it comes time to raise rates; at that time, the Fed has indicated it will increase interest on deposits at the Fed. Yet, even as recently retired Treasury Secretary Geithner studiously increased the average maturity of government debt ever since taking office, Bernanke's scheme has increased interest risk for the government, as the Fed's subsidy of interest payments (the Fed's annual profit passed to Treasury of currently almost $90 billion) is at risk. Never mind the interest risk to the Fed itself, as the Fed does not mark its securities to market. To keep the scheme going, hiding in plain sight, the Fed must prevent bond prices from selling off. The path the Fed has chosen is to communicate to the public that rates will stay low no matter what. Well, almost: rates will stay low at the very least until the unemployment rate falls below 6.5%. The shift from targeting inflation to targeting employment is - in our assessment - precisely aimed at telling the market not to sell off bonds even if inflation were to pick up. Except that the Fed provides lip service to well anchored inflation expectations, without pointing out that this anchor may have already been hauled onto the deck of the ship. So is wunderkind Bernanke hero or villain? We suppose it is in the eye of the beholder. If you are a bond king and have Bernanke publicly announce that he will buy bonds at inflated prices (the Fed buying bonds with an unlimited checkbook rather than letting market prices determine the fair value is, in our opinion, exactly a policy to buy bonds at inflated prices), you can make a buck or two. If you owe a lot of debt, you might be thankful. But if you believe money should be earned, not printed, you might be excused for having a problem with the Fed's policies. Asking gold what it thinks of the Fed's policies, it has no opinion. But asking the market, it appears to scorn the policies pursued, having debased the dollar in terms of how much gold a dollar can buy. But don't ask the pretty guy on the block, ask the outcast: last year, with all the tensions in the Eurozone, the euro managed to end the year up almost 2% versus the greenback and hasn't looked back since. What are investors to do? They can wait for Oprah. They can wait for bonds to sell off. They can prepare themselves for the risk that some of the naysayers have a point. If you are such an investor, please register for our upcoming webinar Thursday, February 21, 2013. Or they can do nothing but read analyses like these, then move on with their lives. Please also sign up for our newsletter to be informed as we discuss global dynamics and their impact on gold and currencies.